Recorded as Tate and Tait, this is an Anglo-Scottish surname. It is however probably of Norse-Viking origin, deriving from the pre 7th century Old Norse word "teitr", meaning glad or cheerful. In its home country it is recorded as the personal name "Teitr", and appears in the Icelandic saga called "Landnamabok". 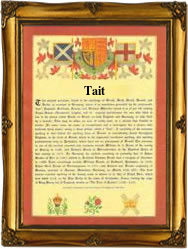 As Tait the name was first recorded in Scotland in 1329 when a debt due by the king was paid to Thomas Tayt, although. Nicholas Tate is recorded even earlier in the Hundred Rolls of Cambridgeshire, England, in the Hundred Rolls of landowners, in the year 1279. It would seem that according to ancient surviving rolls of Scotland that between the years 1362 and 1370 there are a number of entries of payment of pension to one John Tayt, a clerk who was connected with the hospital of Montrose. In England the Anglo-Saxon personal name "Tata" is contained in a number of placenames, among them Tatenhill, Tatsfield, and Tattershill, the latter being recorded as Tateshall in the Domesday Book of 1086. The modern surname is found most frequently in the northern counties of Yorkshire and Northumberland, although Sir Robert Tate and his brother Sir John Tate were both Lord Mayor of the city of London in 1488 and 1496 respectively, and were granted a "Arms". Another interesting namebearer was Sir Henry Tate (1819 - 1899), of the famous sugar firm Tate & Lyle. He was granted a patent in 1872 for an invention for cutting up sugar-loaves. The first recorded spelling of the family name is shown to be that of Uluric Tates. This was dated 1095, in the Feudal Documents of the abbey of Bury St. Edmunds, Suffolk, during the reign of King William 11nd of England, 1087 - 1100. Surnames became necessary when governments introduced personal taxation. In England this was sometimes known as the Poll Tax. Throughout the centuries, surnames in every country have continued to "develop", often leading to astonishing variants of the original spelling.